Stroll down memory lane with Grandma and Flo as they reminisce about their favorite seasons. If you think the denizens of Dinertown like to have a good time, wait `til you see them party down in this dashing sequel. Journey through the seasons with stops at five new restaurants like Crypt and Romantic Rendezvous. 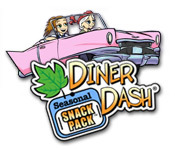 Diner Dash: Seasonal Snack Pack revisits highlights from the first five Diner Dash episodes with additional Time Management levels and restaurants. See Flo go and go! Break out the blueprints and start building your dream town in this resource management sequel.